A young man and woman meet on a train in Europe, and wind up spending one evening together in Vienna. Unfortunately, both know that this will probably be their only night together. Fortunately, there are two sequels. Roger Ebert: The city of Vienna is presented as a series of meetings and not as a travelogue. They meet amateur actors, fortunetellers, street poets, friendly bartenders. They spend some time in a church at midnight. They drink wine in a park. They find a way to exchange personal information by holding imaginary phone calls with imaginary best friends. They talk about making love. There are good arguments for, and against. WaPo: [The] specter of sexual violence -- casual though it may be -- isn't the only shadow in this surprisingly absorbing film. During Jesse and Celine's long day's night together, Linklater creates a suspended, out-of-time feel, as if the characters had stepped off the train and into their own romantic dimension. But underneath the surface, there is also a vague feeling of rootlessness and confusion and perhaps even fear. For all their displays of worldliness and sophistication, these raw kids are trying to make sense of a world that refuses to make sense. What's remarkable is that they connect at all; but then Linklater's point may be that in order for love to bloom, the partners must come to each other without any prior knowledge or expectations or cultural baggage. Rolling Stone: It's the space between people that Linklater evokes so distinctively. His anthropologist's eye for detail keeps the film brimming with the pleasures of the unexpected. After Jesse and Celine say goodbye, the camera returns to the places they visited. The plaintive scene recalls those moments in Vincente Minnelli's The Clock when the young lovers played by Judy Garland and Robert Walker are swallowed up by the tumult of a Manhattan that goes on without them. Unresolved feelings linger, and Linklater, who is clearly a major talent, gives them a startling resonance. NYTimes: If the lovers of "Before Sunrise" don't seem a perfect match, that's somewhat intentional; Mr. Linklater has too much naturalness to give a happily-ever-after rosiness to this story. He means to recall a rite of passage that is real, an intention that comes through clearly even when the film sometimes overreaches or falters. I wonder if there will ever be a Before Noon. I am almost exactly the same age Jesse and Celine are supposed to be, and so I feel a certain tender consideration for them. Having watched each movie in the trilogy at the time it came out, I feel like a mirror has been held up for me every 9 or 10 years so I can see how I have aged (physically, mentally, emotionally) along with them. Going back and watching Before Sunrise a while ago gave me an intense feeling of nostalgia for that time period and also for that version of myself, when I had just finished university and all the possibilities seemed open before me. It's just so joyous and the two of them are so open to potential. I'm not sure I can talk about this first film out of context of the whole series any more, but like hurdy gurdy girl, I'm very close in age to these two characters and while the details of our lives are drifting further and further apart, the truths in all these films seem to really capture my experience/life at each interval. Before Sunrise was a film I enjoyed because it came at that time in my life, like Jesse & Celine, where I just loved discussing life and the universe. Where I'd connect with people through long contemplations of the universe and our place in it. And as a writer, I loved it because it proved that films could just be that - walking & talking and didn't have to be filled with plot. I know this isn't necessarily revolutionary, but it was the right film at the right time for me. And it has the perfect ending. In a world where romantic stories always had happy endings, this one has a perfect question mark at the end. That seems fitting for that time in our young lives where we don't have all the answers. All we have are questions. When the sequel was announced, I was excited and scared. I think more scared that anything. Answering questions can be dangerous. Knowing the answer could dull my memory of the original film. Sometimes, I try to imagine what I thought of that ending - what did I think Jesse & Celine would do - before there was Before Sunset and Before Midnight. And I honestly don't know now. I think I've forgotten what I wished and hoped for then, because life went on - for me and for them. This film is a beautiful wordy gem and it makes me cringe because Jesse is so earnest and they are both so passionate and naive. And that's perfect to capture that time in their/my life. And then Before Sunset happened. And that film actually makes this film even better. And somehow, by some miracle, it improved on this ending. I could talk about these films forever. I hope I get to. And the other thing is, you can't really experience these films the way they should be experienced - with nine years in between each one. I'll say more when we discuss Before Sunset, but damn if the best thing about that film is it made me question how well I remembered this original film - even though I'd seen it a bunch. Just like memories of real life, this trilogy wants us to question what we really remember of Jesse & Celine. And if you watch the films back-to-back, you lose a little of the fun. I'll look forward to reading your next comment in 2025, crossoverman! I'll see you back here then. I first watched this 3 years ago, when I was 26, after reading a blog post from someone who also had grown up with the characters. I haven't seen Before Sunset yet. I think I will watch it at the end of 2018. I thought this would be frustrating, but so far I've been happy just watching Before Sunrise over and over. It's a lovely film. I'm another who is about the same age as Jesse and Celine, and I've seen each movie in the theater when it was released. Before Sunrise is my answer when anyone asks what my favorite movie is. Just a perfect little masterpiece of filmmaking. I've practically memorized it at this point. I love how their conversation keeps circling back on itself, hitting the same topics from new angles, or at a deeper level. I love the playfulness of Celine pretending to call her best friend, so she can talk about Jesse in a creative way, opening up more without the awkwardness of a direct approach. I love the uncomfortable shyness of the listening booth, when they both want to look at the other, but aren't ready to make eye contact--that dance of looking at and away, at and away. There's not a single moment that falls flat for me. I should go to bed, but I'm thinking about starting it up again right now. Damn, I love this movie. I remember very clearly thinking that Jesse would ultimately flake out on her, leaving Celine waiting in the cold for hours, hoping he would show up, before giving in and catching the next train to Paris. Or that maybe Jesse would forget which day or which station it was, and with no way to contact her, be unable to confirm, and so they would miss each other. But I was convinced they would never see each other again, and that it would be his fault. I was a super romantic at that age, so I just had to believe they would meet again. But I never expected to ever know. But I never expected to ever know. See, that's another thing I love about Before Sunrise: the willingness to have a totally ambiguous ending. All you get is this one slice of time, with no idea what happens next. I don't think I had ever seen another movie that did that before I saw Sunrise. That's something that has continued in the later movies. You never have a sense that "this is the last word on Jesse and Celine." And I, for one, would be happy to see them do another movie every nine years for ever. Oh, and I meant to say that I had really mixed feelings when Before Sunset was announced, because I hated to ruin the perfect ambiguity of Before Sunrise. But Linklater got it right. I shouldn't have worried. Oh, I love these movies so so much. I'm a decade younger than Celine and Jesse, but I first paid attention to (it had been on cable tv and I'd passively watched bits of it) Before Sunrise right around the time I spent a year in France and had a very minor romance that I kind of imprinted on this film. Within a year or so, Before Sunset had come out and I remember leaving the theater, alone, in a daze. Like the kind of daze you have after a really great date. I didn't know what to do with myself. No other movies really do that for me anymore. 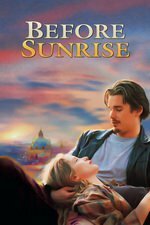 I managed to see Before Sunrise in my early twenties and Before Sunset in my early thirties, even though this was several years after each was released. I still haven’t seen Before Midnight, though it’s really due more to laziness than patience. I guess at this point I might as well wait until my forties, which aren’t that far off. The last time I watched Before Sunrise was on a plane home from Europe, right after I'd spent a couple of hours wandering the streets to kill time before catching the train to the airport. The film really captures that feeling of the in-between times when you’re traveling but you’re not at any of the places where you have something to do. This is one well-timed thread, because I just saw these movies for the first time last week -- I watched one movie a night for three nights running. I'd seen bits of the first one at a laundromat years ago, and nothing but the previews for the other two. The trilogy really is something special, a very naturalistic, intimate portrait of a couple at different stages of their lives. This series joins the Elizabeth movies on the list of "movies I hope they keep making as long as the principal actor(s) lives)". When are we discussing Before Sunset? Or are we waiting nine years? I just watched this film for the first time this week -and will now check out the others in the series. People who loved this my also like Cédric Klapisch's series of French Films "L'auberge espagnole", "Les poupées russes" and "Casse-tête chinois". Like the "Before" trilogy, each film was made about the same characters followed over a period of many years.